Endless Simmer got a sneak preview of the upcoming season of Top Chef at the Taste of the Five Boroughs event in New York yesterday, where we met up with the judges and some chef’testants from the past. (Yes, it’s true, I was that close to Padma Lakshmi.) But most importantly, we got to meet the cast of the upcoming season. They all seemed to be very close with one another, insisted they were all friends, and reported that there was no villain. Riiiiight. Melissa is a sous chef from Boulder, Colorado, and the most personable of all the chef’testants I met. She’s super-talkative, comes off as a party girl, and definitely has some drama potential — she seems more like a Real World contestant than a Top Chef-er. I’d say they’ll keep her around for a bit. If you’ve been missing the Long Island flavor that Howie and Joey brought to Season Three, than you’ll be excited to meet Danny. He’s the chef de cuisine at the Babylon Carriage House in Fire Island, and I’m voting him most likely to get drunk and start fights in the waiting room while the judges deliberate. Radhika is my fav. She’s the executive chef at Between Boutique Cafe and Lounge in Chicago, and I’m already digging her fusiony-y cuisine. She’s way cuter than this photo, and really soft-spoken and sweet. She says she was a religious watcher of Top Chef in past seasons, and has never been more nervous than when standing on the chopping block. I’m rooting for her. More snap judgements — and Padma’s insight — after the jump. Patrick is the baby of the group. He is a tiny little guy and still in school at the Culinary Institute of America. He’s also the only one I believed when he said he really was friends with everyone. Definitely doesn’t have that cutthroat reality show contestant thing going on, but rooting for him as well. After the meet-and-greet, they served us a tasting menu with food from all over NYC, including a lot of the restaurants helmed by Top Chef alums. Nikki was there serving up some grub from 24 Prince, and all the new chef’testants seemed to be friends with her — guess she must make an appearance on Season 5. But she wasn’t doing much better hawking her food than she did on the show, as Dale was right next to her at the Buddakan table, drawing crowds with a foamy lemongrass bubbletea concoction (I thought it was a bit too weird). Spike and Andrew are still all bromance-y, hanging out in the back laughing and drinking. In other former chef’testant news, Lee Ann Wong is looking surprisingly hot. Random but true. The judges themselves were less than revealing (and I’m not just talking about Padma’s turtleneck). Everyone was on strict orders not to give away any serious details about the show, but here’s what they had to say about Season 5 and filming in NYC. 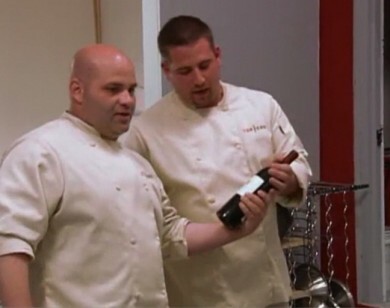 Tom Colicchio: “The chefs were really on top of their game because of the excitement of New York.” Tom said the shoot was mostly in Brooklyn, but they got around the other boroughs a bit, too. And in a shocking, very un-Craftbar admission: “I spend a lot of time in Staten Island.” Woah. Apparently, Tom has a boat out there and loves the SI pizzerias. Who knew! Padma mentioned that the show itself has a new look this year, but couldn’t tell us much more. On the kitchen front, Ms. Lakshmi said she’s been all about cooking simple things lately, because “when you’re eating alone, it’s not really worth it.” OK! So sounds like there’s no new man there. And further solidifying the whole being-my-soul-mate thing, Padma said her current favorite quick-and-simple meal is eggs-in-the-hole, which I should mention I’m getting pretty great at cooking. Also, Gail Simmons revealed that she was planning to dress as Gail Simmons for Halloween, or possibly Stephen from Season One. Top Chef starts Wednesday, November 12th. i’m so sad about padma’s *eating alone* comment. maybe we should have a matchmaking contest for her on ES? Hmmm…anybody else notice about good chefs coming from Chicago? 🙂 Who says Midwesterners are boring?!?! Gregs mom here in Cherry Hill! Gotta tell you I am a secret lurker on your site since Greg told me you wrote a food blog and lurve it so much. I saw you got some love over at Blogging Top Chef and had to say congrats-woot! Great snapshots of the new TC chefties-looking forward to more endless simmer recaps and analysis and foodtalk for this season in NYC! Keep up the great blog! I can’t wait for the new season… anyone else hear about the new Top Chef game?? I played the demo at http://www.topchefthegame.com – it’ll help me pass the time until Wednesday!